Our late, great stallion The Big Investment AQHA (1980-1986) by The Invester was legendary in his short breeding career. With only 129 lifetime foals, he sired 29 Superiors, 64 ROMs, and the earners of 4554 AQHA points. In 1991 The Big Investment was named in the NSBA Hall of Fame joining the list of honored pleasure horses. 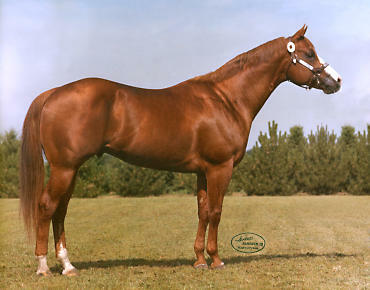 His sire The Invester was also honored as the 1994 NSBA Hall of Fame inductee. Today, the Big Investment's grand get are performing in the same tradition. In 1994, the Paint Horse industry also became acquainted with The Big Investment tradition when Good Ending, his granddaughter, won four APHA World Championships in Western Pleasure. "The Big Investment was ahead of his time in looks, movement and conformation. He helped change the look of the modern day pleasure horse. His offspring were uniformly balanced, & strong over the back, with high withers and deep heart girths. The thing that made The Big Investment so unique, was his prepotency as a breeding horse to stamp his characteristics onto his sons and daughters and now onto his grand get. If The Big Investment had lived a normal lifespan, he would have rewritten pleasure horse history. I believe The Big Investment should be inducted into the NSBA Hall of Fame because he is still today having a major impact on the pleasure horse industry 12 years after his death." Investment Creditor, 1989 NSBA Stallion Owners Futurity Champion with earnings of $25,166. Multiple Champion mare: Investment Ms - Dam of Absolute Investment and Absolute Asset. With only 129 lifetime foals, he sired 29 Superiors, 64 ROMs, and the earners of 4,554 AQHA points. “NSBA Hall Of Fame.” The Way To Go July 1998: 83. Thorton, Larry. “The Working Lines: The Big Investment Part I.” Southern Horseman January 1997: 52-64. Thorton, Larry. “The Working Lines: The Big Investment Part II”. Southern Horseman February 1997: 36-48.